Summer time to me announces ice cream season and what better way to enjoy your favourite flavour than atop a waffle cone. Forget the Styrofoam-like cone and never out of a cup – I pay the extra $$ and always get the waffle cone. In my neighborhood there is a small shop specializing in hand-made ice cream and last week I made a point of having my first ice cream cone of the summer season. When I recently came across this photo of outstanding architecture I was reminded of my favourite waffle cone. 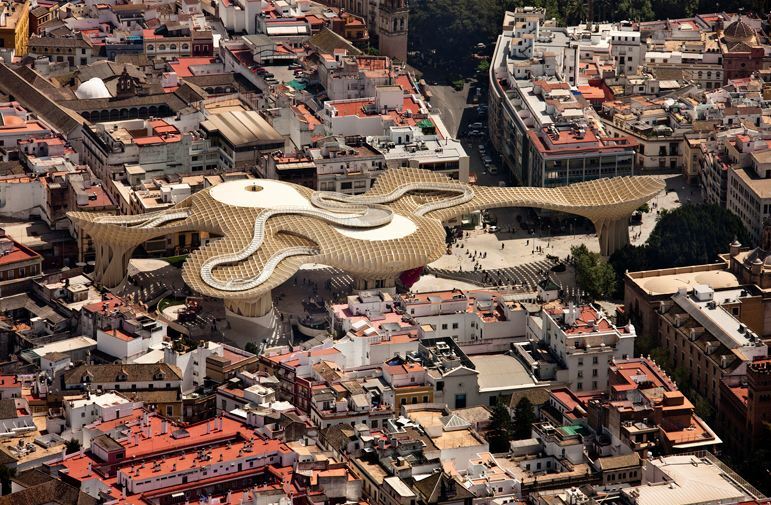 The Metropol Parasol is a unique infrastructure located in Seville, Spain in the old quarter district known as the Plaza de la Encarnacíon. The ‘Parasol’ scheme with its impressive timber/concrete/steel structure was designed by German architect Jürgen Mayer-Hermann and completed in 2011. Standing at an impressive 26 metres high and 70 by 150 metres wide the building claims to be the largest wooden structure in the world. Designed in 4 levels, the underground level houses the Antiquarium where Roman and Moorish remains discovered on the site are displayed. Level 1, the street level, is the Market and Level 2 & 3 is where the panoramic terraces and a restaurant are located. There is also a raised winding walkway that allows for amazing views of the cityscape. 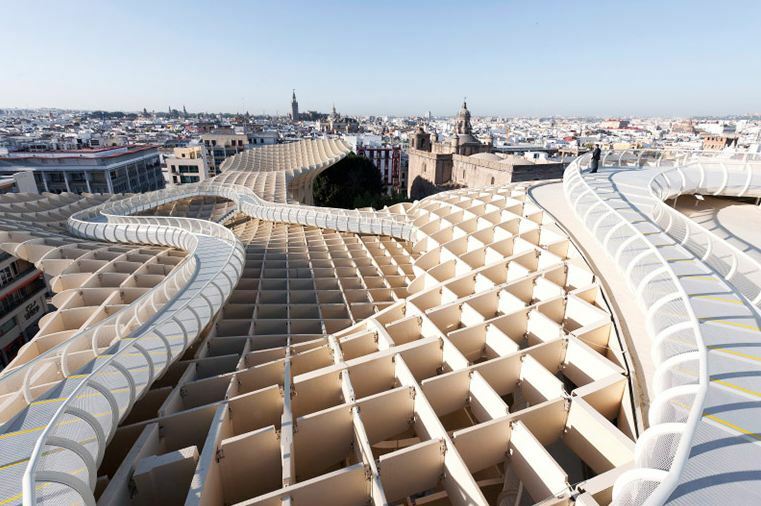 The Metropol Parasol has become a new site of ‘identification’ for Seville as one of the most fascinating cultural destinations in the world today. Its role as a unique urban space within the dense fabric of the medieval inner city of Seville allows for a great variety of activities and tourist locale. And now another destination to be added to my ‘Must Visit’ list! Images via J. Mayer H.
This entry was posted in Design, Style and tagged architecture, Art, Design, planning, PROGRESS, sightseeing adventures, Travel by Modmissy. Bookmark the permalink. Wow, reminds me of a catacomb or a carcass…I’m interestingly amazed. I like the ice cream cone connection. Me too. It occurs to me that I must be thinking about ice cream alot! T’is the season after all. I think this is the most unusual structure I have ever seen! Thanks for sharing! Your cottage ideas sound perfect! The natural light IS something to consider. I SO wish I had a cottage to decorate.